Apparently some Forumgers reported that Seyi Law rejoiced when Kemi Olunloyo was jailed in Port Harcourt and Aunty Kemi is probably just seeing this or do we say she just waited till today- tonight precisely before responding? 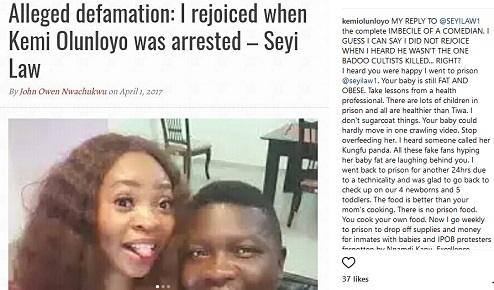 Kemi went in on him so bad, again she called his baby fat, what actually made Seyi Law call her out before now. What she wrote… Phew! Sigh! Sigh!! MY REPLY TO @SEYILAW1 the complete IMBECILE OF A COMEDIAN. I GUESS I CAN SAY I DID NOT REJOICE WHEN I HEARD HE WASN'T THE ONE BADOO CULTISTS KILLED... RIGHT? I heard you were happy I went to prison @seyilaw1. Your baby is still FAT AND OBESE. Take lessons from a health professional. There are lots of children in prison and all are healthier than Tiwa. I don't sugarcoat things. Your baby could hardly move in one crawling video. Stop overfeeding her. I heard someone called her Kungfu panda. All these fake fans hyping her baby fat are laughing behind you. I went back to prison for another 24hrs due to a technicality and was glad to go back to check up on our 4 newborns and 5 toddlers. The food is better than your mom's cooking. There is no prison food. You cook your own food. Now I go weekly to prison to drop off supplies and money for inmates with babies and IPOB protesters forgotten by Nnamdi Kanu. Excellence, Precious and some of those babies in there need our help, instead u are busy rejoicing about people going to prison, a pharmacist who advised u of your child's potential health danger. Shame on you and YOUR dumbass comedy. I highly regret interviewing you giving u the exposure to my 27 million global Forum readers. Go and read more about #childobesity. @majeayida pls forgive my anger here. As a foremost fitness trainer in Nigeria, you promised to do a write up to address fitness in children and childhood obesity but I was locked up for posting a news tip. People like Seyi should focus on people giving them correct info rather than promoting fake cybercrime laws against media professionals. As soon as you are back, pls DM. Sorry about the #Lekki floods. Thanks everyone for reading.